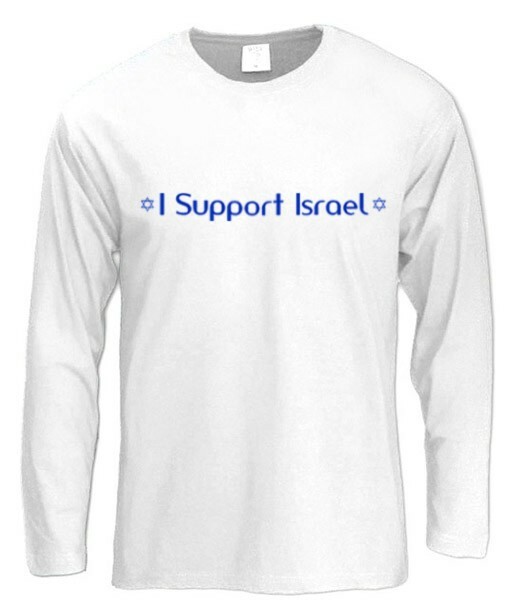 Show your support for Israel! Throughout its history Israel has had more than its fare share of adversity, but each time, through great tenacity and the help of it supporters it has prevailed. Now more than ever, in the face of malicious enemies trying to portray Israel in an unkindly manner to the world media and even calling for financial sanctions, Israel needs you more than ever. Buy blue and white and show your support for Israel with this high quality "I Support Israel" t-shirt. And once again thanks for the help! Our t-shirts are made of 100% cotton and are long lasting with bright colors. Our products are all designed and printed in Israel.